Simple, safe and ultra portable with optional South East Asian maps, carNAVi Eco 300 is your leightweight and compact personal travel assistant for life on the go. 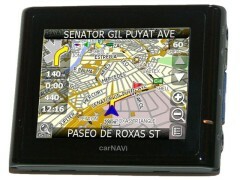 carNAVi leads your way with voice guided turn-by-turn directions to get you there on time and keep you safe on the road. Preloaded with a detailed roadmap covering the whole Philippines including many thousands of points of interest (POI), preinstalled detailed maps of Malaysia and Singapore and a worldwide map of major roads and highways, it’s compact, versatile and easy to use. Additional maps* for most countries in SE Asia are available as well. carNAVi ECO 300 has a build in MP3– and Video-Player, you can hear your favourite songs or watch MPG/AVI videos stored on the SD memory card. The unit comes with a Photo Viewer and Ebook reader.